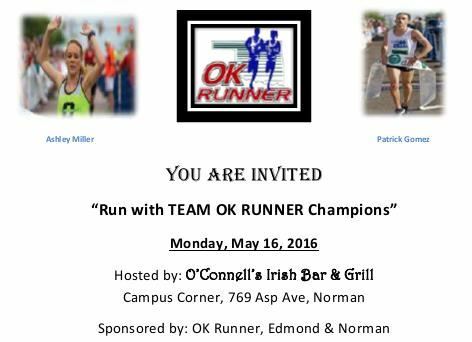 Run with Team OK Runner at 7:00, or arrive prior to 7:45 to hear Mark Bravo recap the 2016 Oklahoma City Memorial Marathon with Team OK Runner champions, Ashley Miller, Kat Lisle, Patrick Gomez and Jason Butler. Enjoy a free soft drink, tea or a cold brewski. Forget about fixing dinner and get 10% off on all food orders and 2nd beverage orders.